Runnable aims to be a huge library of code anyone can search for code snippets and then reuse. 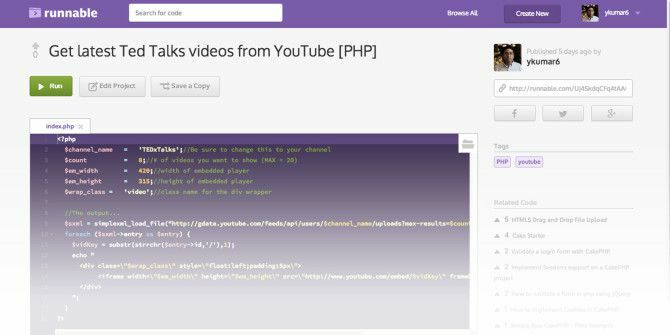 For all practical purposes, they want to be the “YouTube of Code”. Searching for code has become a Web activity now for many developers as they look to fast track development with re-usable bits of code, instead of going through the process of doing it from scratch and wasting precious time. Runnable wants to make it easier to search for those bits of code and fit them together quickly in any developmental project. There are presently 1,000 snippets of code and the index will grow as the site moves ahead. The uniqueness of Runnable is that you can edit and test the code on the site itself in a sandboxed environment. You can also upload your own code and share it with the wider community. Runnable has started off well in a niche that is being serviced by other searchable code repositories Open Source Matters: 6 Source Code Search Engines You Can Use For Programming Projects Open Source Matters: 6 Source Code Search Engines You Can Use For Programming Projects Open source projects need all the help they can get. If not with funding, then with volunteers contributing to open source programming and free tools they can brandish. Search engines tuned with algorithms to find... Read More . But it could become the preferred place to go looking for code as it adds on more community support and vitally, more programming languages.